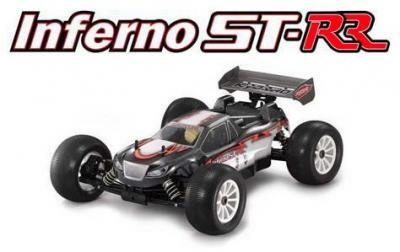 Kyosho have just announced the follow up to their ST-R truggy which was introduced in early 2006, with the announcement that this October will see the release of the new ST-RR competition truggy. The ST-RR is the culmination of a year and half of racing and rigorous R&D and the result is the most refined racing truck on the market. As the 2007 Silver State Champion, the ST-RR is poised to take it to the competition on a whole new level. 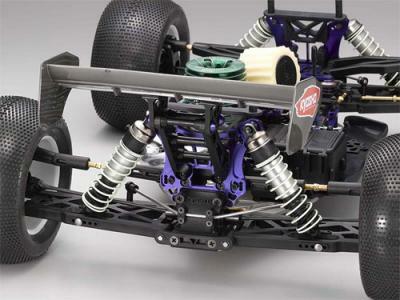 Long Chassis – The ST-RR chassis is 25mm longer than the ST-R. 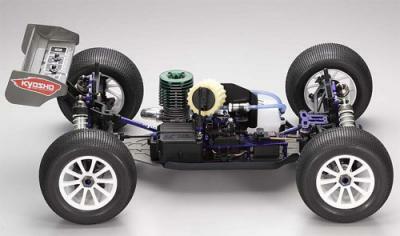 The chassis is the best performer chosen from four different prototype chassis tested. Instead of just guessing and producing a random long chassis, the designers and team drivers exhaustively tested different configurations of varying lengths and weight distribution to establish which provides the best performance. The front-weighted chassis that was chosen features extra length for rock-solid stability in the bumps, while concentrating weight as far forward as possible to give the ST-RR exceptional steering response. It’s the best of both worlds; ultra crisp steering response and unrivaled stability. Big Bore Shocks – Bump handling is greatly improved with the addition of the new big bore shocks that are included with the ST-RR. The big 16mm pistons and shock bodies are 23-percent large that the shocks on the previous ST-R for great stability even through dramatic temperature changes and long main events. These shocks provide unmatched stability over jumps and through the bumps to give this machine an unbeatable edge in the heat of racing. New accordion-style shock boots keep the big 3.5mm shock shafts clean. Chrome Moly Ring & Pinion Gears – The internal ring and pinion gears of the drivetrain are now formed of the strongest material, which means the ring and pinion gears will be better able to withstand the punishment of long races and the biggest, most powerful engines. Lightweight Universal Driveshafts – The new driveshafts feature a lightweight design and are made from ultra-durable chrome moly steel – the strongest and most durable material ever used. 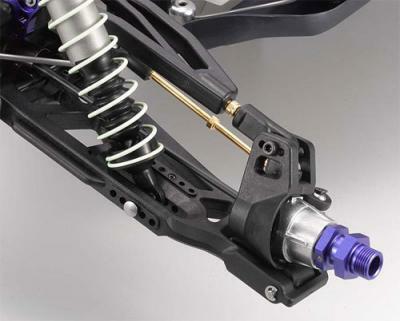 Installed at the front, center and rear of the drivetrain, all of the driveshafts feature a distinctive black finish. Low Profile, High Down-force Body – Looks are almost as important as performance to some racers, and the new ST-RR includes a modern, low-profile extended body to fit the long chassis of the truck. High-Grade (HG) Air Filter – Introduced in the 777 WC Edition buggy, the HG air filter features a new high-density, high-flow foam that is more resistant to various types of filter oil. The high-density structure of the foam means this filter captures more dirt particles to keep your racing engine running stronger for longer. The high flow rate means that the engine can still breathe exceptionally well and maintain maximum power even through a grueling 1-hour main event. The faceted texture of the outer filter provides more surface area, which means it breathes better for longer than a standard round filter. 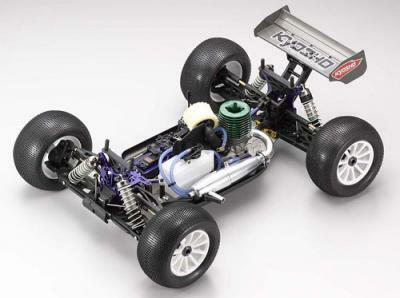 Legendary Kyosho Quality – In addition to all the exciting new features, the ST-RR also features the unique manufacturing methods and premium quality materials that make Kyosho vehicles legendary for their quality, precision and durability. 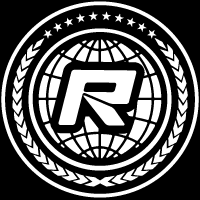 Most of the details are not obvious because some plastic parts look just like other plastic parts, but only the experience of seven 1/8 off-road World Championships (more than all other manufacturers COMBINED) provides the unique knowledge of exactly what materials and designs work best. 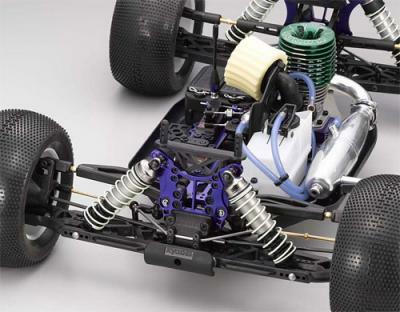 Whether it’s precision grinding for exact parts fit, high-grade race-tested composites, high-tech aluminum and steel alloys, space age coatings or premium-quality bearings, there are plenty of reasons why educated and experienced racers prefer Kyosho.